I am pleased to announce the immediate availability of Inquisitor 2.2 – the ultimate instant search extension for Safari. Inquisitor 2.2 combines as-you-type instant search, search term prediction, and multiple-engine searching in a refined interface. The major change in version 2.2 is that the core search engine for instant results has been changed from Yahoo to Google. This has two positive consequences. Firstly, instant results are now far more relevant and useful. Secondly, instant results are even more ‘instant’, as the Google results can be loaded much more quickly than before. Fast and relevant – it doesn’t get much better than this! Also, like NewsFire, Inquisitor is a Universal binary, so it will run great on Apple’s Intel Macs. I am pleased to announce the immediate release of NewsFire 1.3, the sexiest RSS feed reader on Mac OS X.
NewsFire 1.3 is a major release with many new and improved features. NewsFire has undergone a serious makeover. With its new streamlined borderless appearance and support for site icons, NewsFire is more beautiful than ever. Usability has been improved with newly designed web feed and search feed addition panels, a ‘next new item’ button, and improved menu layout. There have also been major internal changes, with performance improvements across the board and a brand new, more fault-tolerant and feature-rich RSS/Atom parser. Last but not least, NewsFire 1.3 is released as a Universal binary, making NewsFire the first RSS reader on the platform to take full advantage of the amazing speed of Apple’s new Intel Core Duo Macs. Version 1.3 lays a strong foundation for future innovation while preserving NewsFire’s core attributes – simplicity with sophistication, ease-of-use, style and beauty. NewsFire 1.3 (v56) is now available for download. This release addresses minor issues in v55 and is now a Universal binary. – It’s fast. Not blindingly fast, but it seems to trump my dual-2.0GHz G5 PowerMac in general responsiveness. As an example, the PowerMac would normally compile NewsFire in about 50 seconds. The iMac managed it in 30 seconds. – NewsFire is smooth as butter on the iMac. – PowerPC emulation seems to work solidly, but it is somewhat slower than I anticipated – maybe 1.0GHz G4 slow. We definitely need Universal apps en masse. – The screen is gorgeous and the machine is perfectly silent. A great user experience. – Moving NewsFire over was quite painless. A single endian issue came up and that was about it. With the Canadian federal election a week away, there is a growing storm of debate over the state of copyright policy in Canada. This was triggered by the recent revelation that Liberal MP and candidate Sam Bulte has had her campaign bankrolled by an industry lobby backing American-style copyright policy (which is curious behavior from a party that attacks the pro-American leanings of its Conservative opponents). Us Canadians are wary of American-style legislation in general and even more wary of American-style pork-barrel politics. We expect our politicians to stand up for the interests of their constituents, not the interests of foreign media corporations. The most important realization that any Canadian can make about this countryâ€™s music industry is that it is almost entirely beholden to foreign parent companies. Now, many of you might be labouring under the false assumption that the primary concern of Canadaâ€™s foremost corporate music giants is the promotion and support of domestic artists, but nothing could be further from the truth. It is time for a new approach that starts with a commitment from all MPs who accept funds from the copyright lobby not to serve in Ministerial positions or on legislative committees that involve copyright policy. The final week of the election campaign provides the ideal opportunity for Canada’ s leaders to begin to clean up Canadian copyright. Of course, there is also the more direct solution of simply not electing politicians who take money from lobby groups. This is something we will get the opportunity to do next week. NewsFire 1.3 (v55) is now available for download. This release tweaks site icon loading slightly to be more efficient. As the release of NewsFire 1.3 approaches, I would like to get some localizers in place for translating the website and the application itself. The top three non-English languages used are French, German, and Japanese. If you are interested in providing your translation skills to one of these three languages and have prior experience localizing Mac OS X Cocoa applications, please contact me at feedback@newsfirerss.com. Thanks! NewsFire 1.3 (v54) is now available for download. This release has several minor tweaks over v53, but no major changes. NewsFire 1.3 (v53) Beta is now available for download. 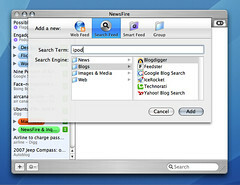 This release fulfills the long-standing request to have NewsFire download and display site icons for its feeds. I had always debated with myself whether site icons were unnecessary visual clutter or useful visual cues. The latter opinion won out in the end, though individual users can set the appearance preference whichever way they prefer. Site icons are enabled by default right now, but I may change this. Unless I have any last-minute feature inspirations, I believe that the 1.3 beta line is wrapping up. I’m sure there will be a few bug-fix releases before general release, but most of my feature goals have been met. On a different topic, I ordered a stock Intel iMac today, with expedited shipping even, so I can immediately get to the task of verifying and optimizing all my software for these new machines. I never had any real interest in getting a developer “transition” machine, opting for the real thing instead. My software is essentially pure Cocoa, so I do anticipate delivering universal binaries within a few hours or days of getting the box… depending on how much fooling around I do before working, of course. NewsFire 1.3 (v52) is now available for download. This release sees the addition of a new search feed panel that makes it very straightforward for even the novice user to add custom search feeds for common search engines and content sites. Also, if there is a search site that publishes in RSS/Atom that would be widely useful and that you think should be added, please leave a comment. Let me highlight a related shortcut that may not be well-known. In addition to the menu shortcuts, you can use modifier keys and the “+” add button to create smart feeds, search feeds, and groups. Clicking the ‘+’ while pressing ‘option’ brings up the smart feed creation panel. Similarly, ‘control’ brings up the search feed creation panel and ‘shift’ brings up the group creation panel. These modifiers are consistent with their menu equivalents. NewsFire 1.3 (v51) is now available for download. This release corrects some navigation issues in v50 and adds a “Jump to next new item” button that is functionally equivalent to hitting the spacebar.